Trying to explain Second Life to folks who have not spent much time in-world can be an interesting challenge. Some folks know that I have taken on the role of VP of Bizdev over at Electric Sheep Company, so I’m spending more and more time explaining and introducing SL. I wanted to present two takes on explaining SL, the first of which is a video we did for the New Media Consortium (a not-for-profit consortium of nearly 200 leading colleges, universities, museums, corporations, and other learning-focused organizations). The NMC’s Campus Observer just blogged it here. The next piece is some words I jotted down while prepping for a presentation at the NMC’s summer conference. Don’t expect groundbreaking insights here… that’s not what I am attempting. Rather, I hope through repeated and different takes like this, together we can all come up with better ways to describe this world that has captivated our attentions. Second Life, shortened by most to “SL”, is an online virtual world where anybody with a broadband connection and a reasonably powerful computer can interact, create, educate, play, and work in a graphically-rich 3D environment. It is an immersive space where you interact with your surroundings and other people through an avatar (a representation of a human, or non-human, being) that walks, flies or drives around. SL is a persistent space, meaning that it is “always on” and time runs linear to the world not to the participant (just like the real world). Linden Lab, a technology company in San Francisco, created the underlying technology behind Second Life, but it is essential to note that almost the entire world -- from the buildings you see to the clothes and hair you wear to the animations that let your avatar move –are created by residents of Second Life. Through your avatar, you can BE in a space, and let your imagination carry you from a computer screen into a new world. Naturally, the more sophisticated the design of the 3D space, the easier it is to make this mental leap. People spend hours, even months, honing and customizing their avatars: how they look, what they wear, how they move, etc. Some people try to make their avatar reflect their real-world body, while others experiment with more imaginary forms. As part of Second Life, Linden Lab created custom design tools to help residents build 3D objects. Most of the graphics, which are mapped onto the 3D objects, are made offline in applications such as Photoshop, Paint Shop Pro, or GIMP, and uploaded to the virtual world. 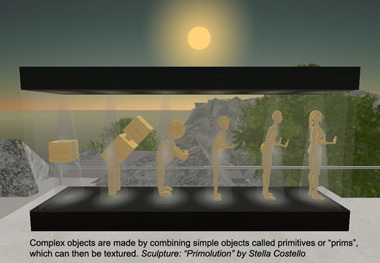 SL also offers a rich programming language to bring objects and environments to life. This ranges from simple programmed behaviors (a driveable car or a turning windmill) to incredibly complex interactivity (dynamic buildings which change on the fly, scripted productivity tools, or games built on top of the underlying platform). In a virtual world, there is no weather, no hunger, no sickness. The physical rules of reality are optional; for example, a bridge can be held up by a ray of light rather than cables and concrete. You can fly! The inefficiencies of distance are relatively meaningless because you can teleport instantly from place to place. The one thing that remains the same in a virtual world, however, is human nature. Behind every avatar is a person sitting at a computer, most of whom are anonymous behind an avatar name, and so you see the full range of human activity from the most noble to the most base. There are a few hundred thousand users registered with Second Life and at any point in time, there are thousands of people logged in from around the world. About 25% of Second Life residents are international, the average age is in the early 30’s, and just over 40% of the member base is female. So what do people do there? SL has remarkably few rules, which causes early confusion for some folks more used to the structured environments of online games. While many people use it for entertainment, and while you can build games on top of the technology, Second Life is not in-and-of-itself a game. Most consumers use it as a place to socialize, play, experiment, doodle creatively, and shop. Some people have created towns and local governments. Some have created historical or fantastical environments, like a Victorian village, where they role-play characters within their constructed context. 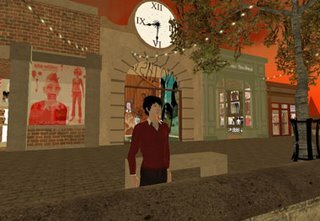 A growing army of entrepreneurs and designers are building online businesses to sell virtual goods and services to other members of Second Life, to the tune of over US$5 million in economic transactions a month. The range of goods being sold is immense, and covers such categories as clothing, accessories, vehicles, interactive tools, buildings, furniture and land. Services include custom creative services, promotion and marketing, games, role-playing environments, and much more. Economic transactions are handled through a local currency, the Linden dollar, which is bought and sold on an open currency exchange called the Lindex. An increasing number of real-world organizations are using Second Life for a wide variety of tasks. Virtual worlds remove the problems of geography and distance, making Second Life a perfect place for online conferences, events, and live concerts. For example, it is relatively easy to stream live video of a real-world event into a virtual counterpart, and some events even operate as a “simulcast” where the virtual event is streamed into the real-world venue. The 3D, immersive nature of SL makes it a great place for simulation, training and education. Imagine teaching medical applications by being able to walk through a giant version of the human body, watching the virtual biological elements around you change and react based on your actions. Imagine training a new customer service hire within a virtual version of your store, learning their way around and dealing with difficult customers in live scenarios. Virtual worlds also provide companies a fascinating way to build new bridges to their customers, whether for marketing purposes, customer support, or customer feedback. Whether you are looking at Second Life as a consumer or for business purposes, at the end of the day, the best way to understand SL is to try it. It may take some perseverance as you adjust to the interface and how to move around, but hang in there. You will start to discover how an immersive environment truly spurs relationship building between people. You will start to understand what people mean when they say you feel like you are actually with somebody, sharing a space and an experience. That is the true power behind the magic. Second Life, Mozilla and You!